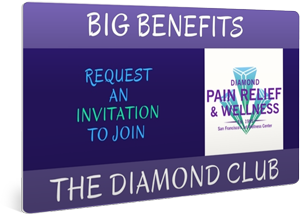 You need to read this post if you are experiencing any pain or discomfort from the long days in the office. Musculoskeletal injuries are rampant in the workplace. One of the most common complaints from office workers are injuries known as repetitive stress injuries (R.S.I.) and the main cause of these injuries is an in-effective, poorly adjusted workstation set-up. Your Work-station at a desk job usually includes your chair, desk, computer monitor, keyboard, mouse, phones and filling. At work most people simply use the computer that was assigned to them when they first started at their job without thinking of how it should be set up ergonomically. Maybe you also just plopped down in the chair without recognizing there could be some adjustments to better fit your body and needs. Each body is different, with different angles, torso length, arm lengths, etc. It is imperative that you have your desk set up properly to avoid muscle tension, headaches, eye-strain, and injury. Here are the top 10 tips to consider when “fitting” your body to your desk computer. You DON’T NEED A FANCY CHAIR! a) Sit in a chair with a seat that allows for 2-3 inches of space between your knees and the edge of the seat. b) Your knees should be at a 90 degree angle. c) Both feet should be able to be placed flat on the floor or on a foot-rest, if your legs are too short to touch the floor. You don’t have to keep both feet on the floor the entire time, it’s best to change placement as often as possible. You can even sit with legs crossed, or under you — just mix it up! d) Your lumbar curve should be supported preferably by your own back strength, but you can also use the seat or supplemental padding following the curves of your spine along your low back. e) Set arm-rests low or remove them completely so that while working, elbows are free and shoulders relaxed. 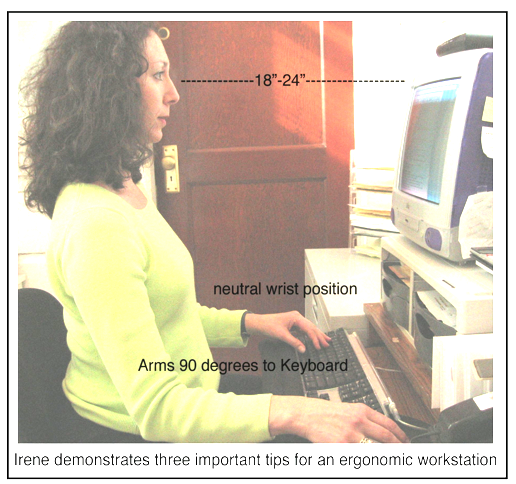 a) Place keyboard so elbows are at a 90-100 degree angle. b) Use a wrist support to keep your wrist off the desk or keyboard tray. Wrists should be parallel to flat surface, slightly elevated and straight, without fingers higher or lower than wrist. a) Set monitor so that eyes are level with the top of the screen for a 15″ monitor and 1/4 of the way down from top of the glass on a monitor 17″ or larger. b) Eye distance from screen should be 12-24″ and no more than one arm’s length away. Some suggest lowering the monitor and keeping it angled at about 45 degrees, so your head is upright, but your eyes are looking down. This keeps more of your eyeball covered by your eye lid to prevent eye dryness and also keeps your head in a neutral position. You can play with both options to see what feels and works best for your desk set-up. a) Place mouse on the same level as close to the keyboard as possible. b) When possible move your entire arm, not just your wrist. a) When working from paper, use a document holder rather than laying it on the desk. b) Keep the document as close to you as possible, either at eye level or directly in front of you, just below the monitor. c) If you’re doing a lot of reading from an external document, switch the placement of it often so you’re not always turning only too one side. a) If you use the phone frequently you must use a head set or a speaker phone. This is especially true if you type or write while on the phone. b) If you are not using a headset hold the receiver to your ear. Do not cradle receiver between chin and shoulder. c) Place the phone just to the left side of your desk if you are right handed and to the right side if you are left handed. d) Place the phone close but it is not bad to move and have to extend your reach to use it, to get more movement. e) Be sure cords are out of the way, so you’re not wrestling with them! a) Remove precariously perched items from your work area. If you are afraid you’ll knock something over, you may mal-adjust your body accordingly. c) Notice and make appropriate changes if you always turn to one side or the other to talk with people or reach into a drawer. d) Maintain enough clearance under desk for legs to move easily and often. a) Hold your head centered above your torso – not forward. b) Sit up tall with or without lumbar support. c) Keep shoulders relaxed and down. This means every time you hit the ‘save’ command, do a few shoulder circles, neck stretches, or shake your arms. This should only take a few seconds and not be an interruption to your work. b) Every 15-20 minutes get up, even if its just for 60 seconds to move and stretch. This allows the blood to circulate and eases muscle tension. c) Use a kitchen timer or software to remind you to move, get up, or change tasks. Don’t go out and buy anything new until you know what you need. All those fancy, expensive chairs may not be necessary or fit you properly! Start by determining what, if any thing, is adjustable at your workstation. Most chairs, monitors, and keyboard trays can be lifted or lowered, though most desk heights are not adjustable. I always recommend starting with your keyboard tray and chair in tandem. Place the seat of your chair at the proper height for your knees so they are at a 90 degree angle. Sit up straight and place your hands on the keyboard. Are your elbows at a 90 degree angle? If you are a tall person, and your chair is set correctly, you may find your keyboard tray too low. If so, you can either raise your keyboard tray to a higher position or place your keyboard and mouse up onto the desktop. If you do move your keyboard up on the desktop you may need to raise your monitor. Many stores sell all sorts of nifty monitor supports that not only raise your computer, but provide additional storage space underneath for stamps, papers, etc. If you are a shorter person, begin with finding the correct angle for your elbows. Once you know where that placement of your elbows should be, raise your chair so that your elbows are in this correct alignment. A footrest is necessary to elevate your feet so your knees are at the 90 degree angle. Once your chair and keyboard fit you correctly, you can now begin to raise or lower your monitor so the top of the screen is at eye level. Move your monitor close enough to you so you don’t have to lean in or press your head forward to see the screen. Adjust your phone, document holder, files, etc., so they are in the right places to be able to access easily and ergonomically. Once in this new ergonomic alignment, you should feel less pain and be more productive. 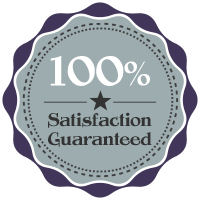 With the right set-up, you can enjoy your new work station, be more productive, cut down on work comp or time off for recovery and be rewarded with years of comfortable work! To learn more about ergonomics and to see how we can educate employees at your company CLICK HERE! I would like to thank you for sharing this amazing content with us. The most informative point in the content is ‘Posture to Maintain’. In today’s world, we need to have a proper posture while working, as bad posture causes several cardiovascular problems. Thanks for the comment. We know posture is important because of the strain we often have on specific areas of our body if we’re slouching with our heads forward or shoulders elevate. HOWEVER, we should be most aware of the importance of movement, rather than staying static. Even if we are sometimes in ‘poor posture’, the key is to change positions frequently to activate muscles and stretch and change the gravitational forces pulling on our structure.